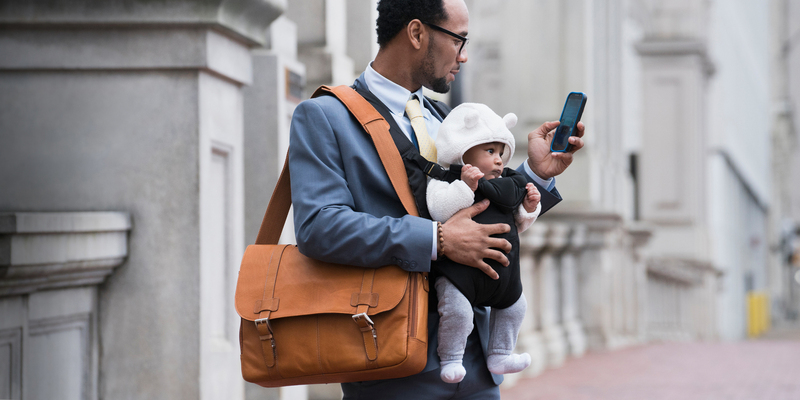 Boomer women surged into the workforce as young adults, setting the stage for more Gen X and Millennial women to follow suit. 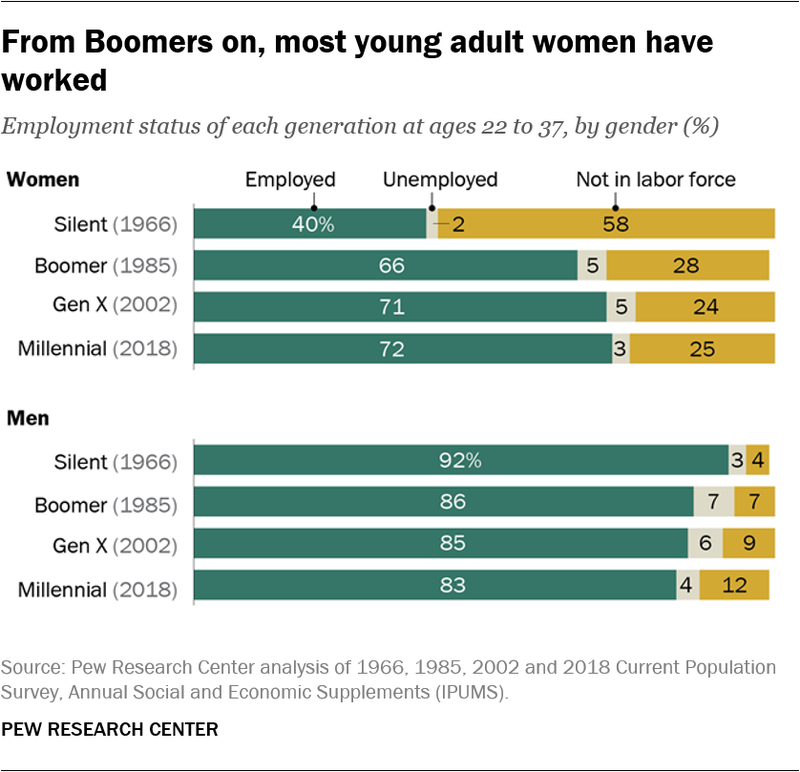 In 1966, when Silent Generation women were ages 22 through 37, a majority (58%) were not participating in the labor force while 40% were employed. 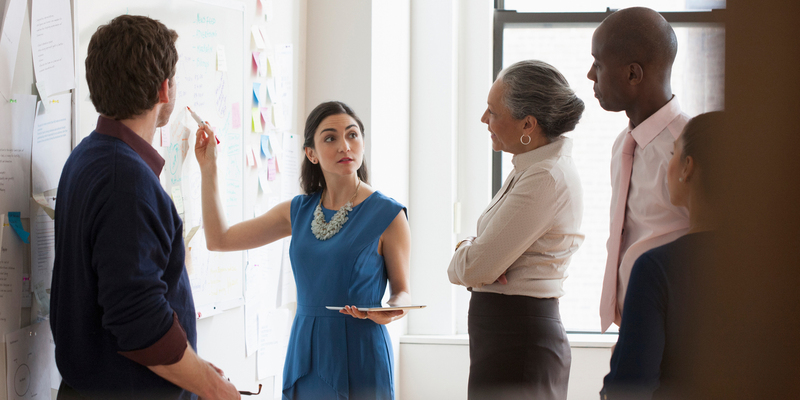 For Millennial women today, 72% are employed while just a quarter are not in the labor force. Boomer women were the turning point. As early as 1985, more young Boomer women were employed (66%) than were not in the labor force (28%). The growing gap by education is even more apparent when looking at annual household income. 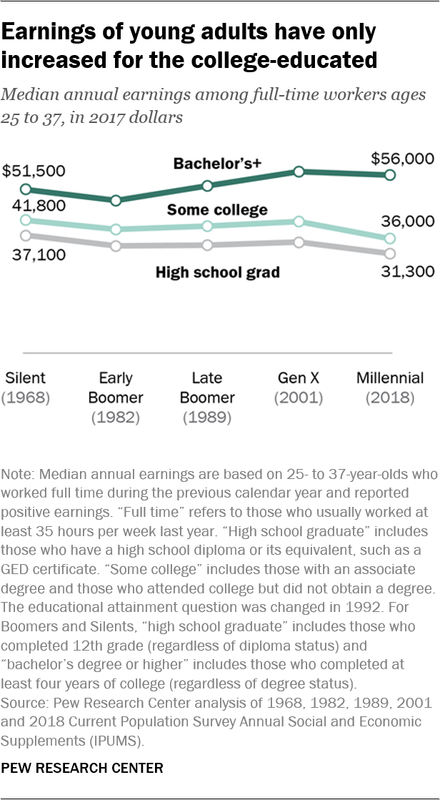 For households headed by Millennials ages 25 to 37 in 2018, the median adjusted household income was about $105,300 for those with a bachelor’s degree or higher, roughly $56,000 greater than that of households headed by high school graduates. 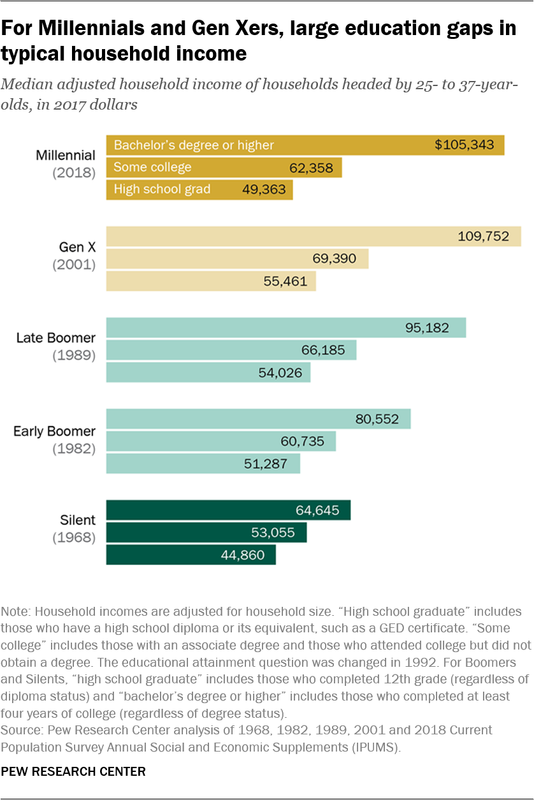 The median household income difference by education for prior generations ranged from $41,200 for late Boomers to $19,700 for the Silent Generation when they were young. Millennials, hit hard by the Great Recession, have been somewhat slower in forming their own households than previous generations. They’re more likely to live in their parents’ home and also more likely to be at home for longer stretches. In 2018, 15% of Millennials (ages 25 to 37) were living in their parents’ home. 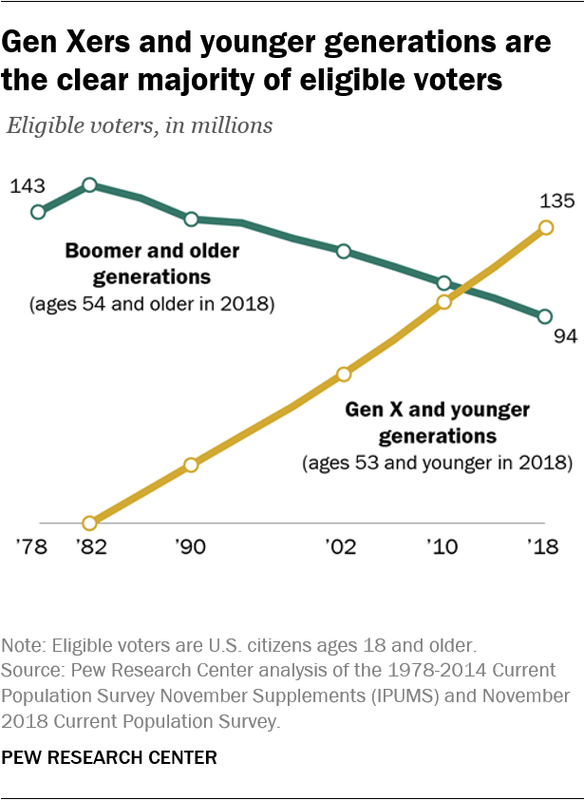 This is nearly double the share of early Boomers and Silents (8% each) and 6 percentage points higher than Gen Xers who did so when they were the same age. On the whole, Millennials are starting families later than their counterparts in prior generations. 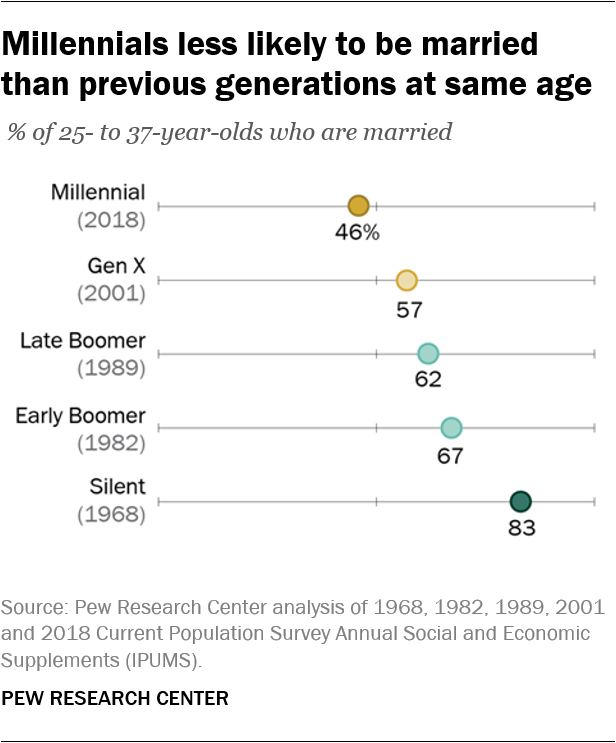 Just under half (46%) of Millennials ages 25 to 37 are married, a steep drop from the 83% of Silents who were married in 1968. 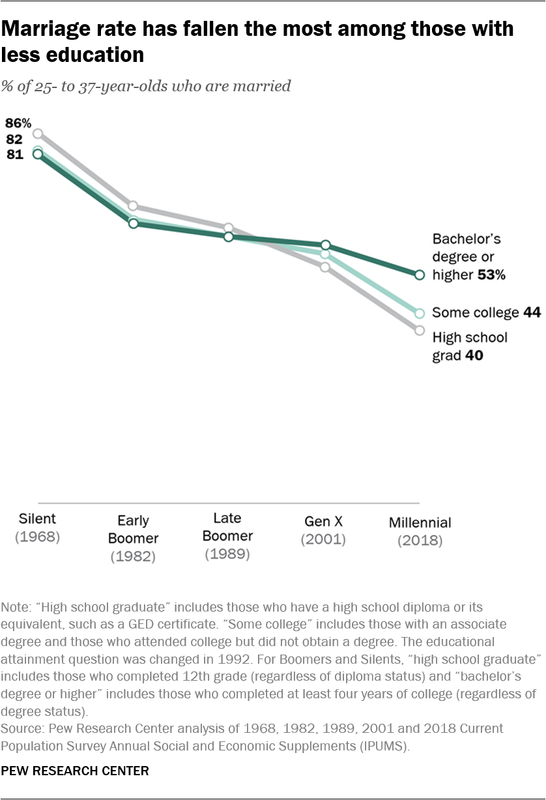 The share of 25- to 37-year-olds who were married steadily dropped for each succeeding generation, from 67% of early Boomers to 57% of Gen Xers. This in part reflects broader societal shifts toward marrying later in life. In 1968, the typical American woman first married at age 21 and the typical American man first wed at 23. Today, those figures have climbed to 28 for women and 30 for men. But it’s not all about delayed marriage. The share of adults who have never married is increasing with each successive generation. If current patterns continue, an estimated one-in-four of today’s young adults will have never married by the time they reach their mid-40s to early 50s – a record high share. 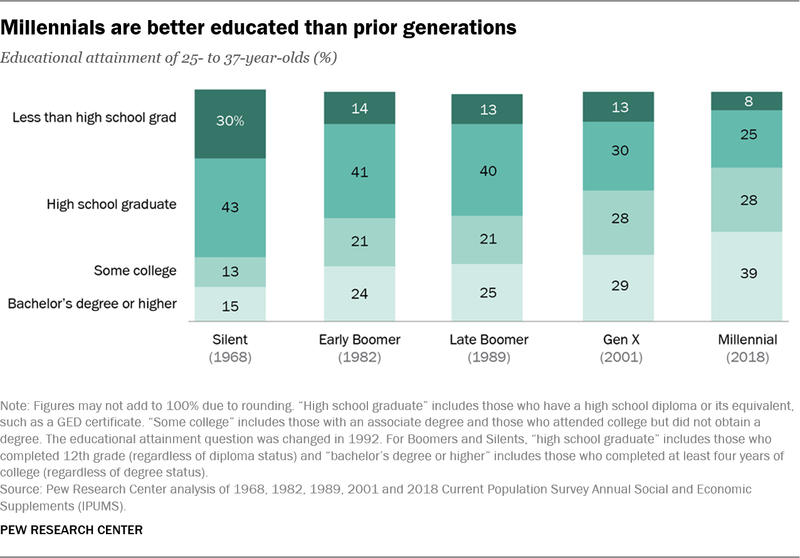 In prior generations, those ages 25 to 37 whose highest level of education was a high school diploma were more likely than those with a bachelor’s degree or higher to be married. Gen Xers reversed this trend, and the divide widened among Millennials. 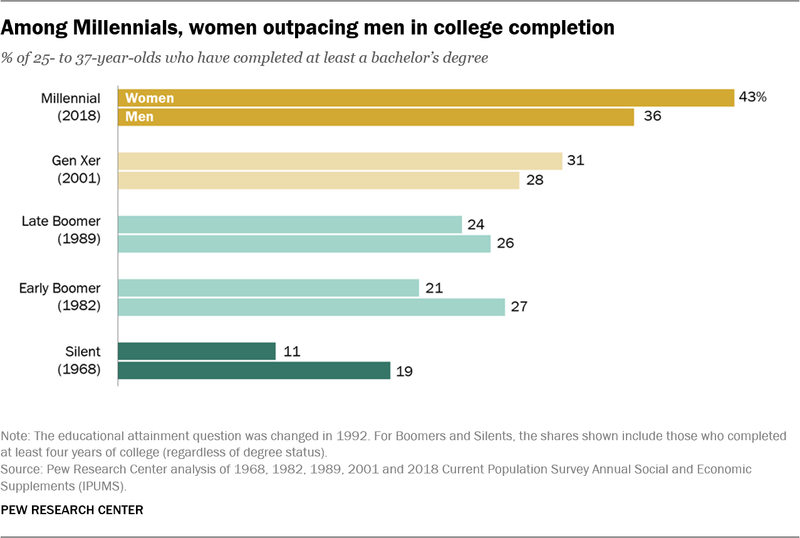 Four-in-ten Millennials with just a high school diploma (40%) are currently married, compared with 53% of Millennials with at least a bachelor’s degree. 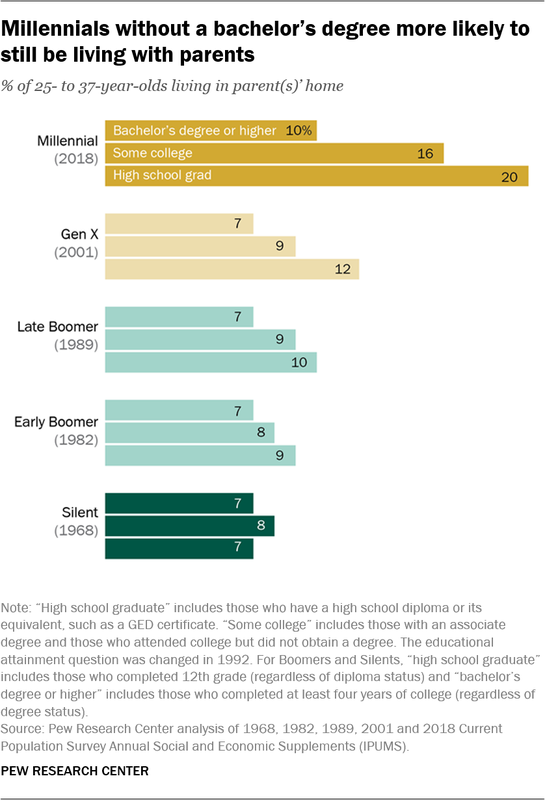 In comparison, 86% of Silent Generation high school graduates were married in 1968 versus 81% of Silents with a bachelor’s degree or more. Millennials are also bringing more racial and ethnic diversity. 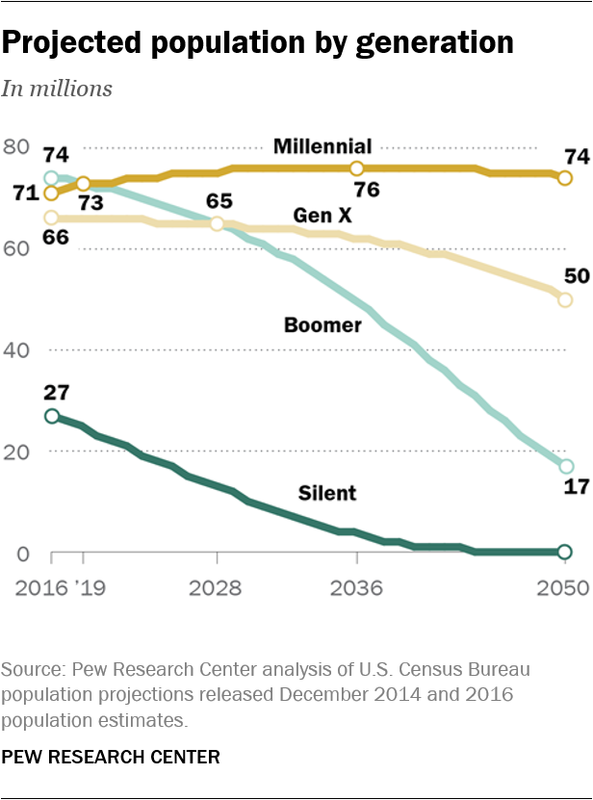 When the Silent Generation was young (ages 22 to 37), 84% were non-Hispanic white. For Millennials, the share is just 55%. This change is driven partly by the growing number of Hispanic and Asian immigrants, whose ranks have increased since the Boomer generation. The increased prevalence of interracial marriage and differences in fertility patterns have also contributed to the country’s shifting racial and ethnic makeup.